A small group of us walked through the snow mantled woods today not only in a blizzard but in a thunderstorm. It was a bleak landscape appropriate for the close approach of Yule, Midwinter. One of our group wanted to see the pentagram on the oak stump in Holman Wood. Years ago people used to go there - maybe a group of modern pagans or wiccans - but there seem to have been no recent visits. The stump was covered in snow and, as I brushed if off with my hand, it filled the grooves that had been cut to make the pentagram so that is stood out like a pattern on scraperboard. The device wasn't immediately apparent but emerged, as though by magic, as the side of my had swept over the wood, packing snow into the grooves. The pentagram has been used in a huge variety of contexts, often religious, for at least 5000 years and its meaning varies according to whether the single point is at the top of the bottom. In this case it is simply where I happened to be standing that put the point below. The falling snow, the thunder, the stillness of the winter wood gave a luminous mystery to the cold emergence of this mystical symbol from the dark, dead stump. As we stood the continually falling flakes of snow quickly obliterated the brief and icy revelation of this winter star. On a lovely autumn day I walked around Coneyburrow Wood and some nearby areas. There are still some interesting fungi about. I found the always late wood blewits (Lepista nuda) in several places. If well-cooked this is an edible species and I have had it from time to time but, I have to say, I am not too keen on it as food - I just enjoy its pale mauve embellishment of the November Woods. There was also a rather fine turkey tail fungus (Trametes versicolor) growing on a stump, in this case without a very strongly marked pattern of differently coloured rings on the cap. On another stump I found a neat little puffball which I think is just a baby Lycoperdon perlatum a common woodland species. All the pictures I have looked at show it as having a broad, short stalk below, but this may develop on the example I found, or be hidden in the moss. Another striking feature today was the lovely golden colour of the larch trees (Larix spp.) as they shed their needles for the winter. They are not a native British species and, generally speaking, I find them rather ugly with lots of dead, spiky branchlets. They do, however, have this autumn moment and another in spring when the fresh green needles emerge. The areas cleared last year on what we call 'Sedlescombe Heath' are showing signs of benefit from the extensive conservation work. In places dwarf gorse and heather seedlings are growing well and there are now two sites for dodder (Cuscuta epithymum) which we thought we might have lost. The strange thing is that this parasitic plant, when in flower, looks much like heather (Calluna vulgaris), its host in Brede High Woods, but it comes out a few weeks before the heather so can be easily spotted. Before flowering it looks very different (see above) as a mass of tangled, red threads with no chlorophyll. Dodder is a declining species that was formerly much more abundant on the unimproved heathlands in Sussex and elsewhere. Another plant that is taking advantage of the new clearances is heath groundsel (Senecio sylvaticus) which seems almost confined, though in considerable quantity, in the area just south of the orchard where the Norway spruce was cleared. I have a feeling the wind blown seeds must have been caught by the pine branches and have lain dormant until there was sufficient light to trigger their germination. The plants seem to be very ephemeral and I suspect they will decline and disappear in this area within a year or two as other species develop. Butterflies are also benefiting from the wider rides and longer woodland edges. The only one I photographed was this very worn female ringlet (Aphantopus hyperantus), a species that is actually expanding its British range. Also on the wing were meadow browns, gatekeepers, small coppers, red admirals, large and small whites, large and small skippers and several silver-washed fritillaries, a splendid butterfly that seems to be having a good year. There was also a red and black burnet moth zooming across Holman Wood Field. Probably a six-spot and good to see as this seems to be another attractive species that has declined massively in our area over the last few years. Today, 22 May, is the International Day of Biodiversity. In the spirit of such an event a group of us, under the auspices of Butterfly Conservation, went on a caterpillar foray in Brede High Woods. The weather was glorious, but the adult butterflies rather few. Despite enlightened management species like the grizzled skipper, the green hairstreak or the pearl-bordered fritillary no longer seem to be present. However, there was a compensation. In a waist high grove of aspen suckers we found several groups of the larvae of the ladybird-like leaf beetle Gonioctena decemnotata, a Nationally Notable (B) species normally found on aspen. The remarkable thing was that each group of the black leaf-munching larvae was guarded nearby by an adult, presumably mother. Such solicitousness for offspring is rare in the insect world and I would imagine a small vegetarian beetle would have minimal ability to drive off a hungry predator. Does the red colour, I wonder, act as a sort of stop light and say "keep your distance." The only other East Sussex record for this species I can find is from Bixley Wood a few miles from the Brede High Wood site. Yesterday we saw several small flies scooting about on a sticky film of fungus mixed, maybe, with sap on the stump of a tree felled last year. I went back today and was later able to identify the insects as one of the commoner fruit flies (Drosophila subobscura) below. Usually they go for fermenting fruits and can be a pest in breweries and distilleries though, according to one account, they "transfer wild yeasts that give fine wines their bouquet." These were not the only invertebrates active along this particular bank: a queen bumblebee droned by and a marmalade fly (Episyrphus balteatus) settled on a foxglove leaf. There were more primroses and celandines out today as well as some less conspicuous early developers such as the dog's mercury (Mercurialis perennis) and swan's-neck thyme-moss (Mnium hornum) below. This afternoon we walked in the warm sunshine for a couple of hours round the High Woods. Very few flowers are out yet apart from the hazels, but we did see a primrose and a celandine. On Brede High Heath young birch is being cut to make jumps for horse racing. This will also help to keep the area fairly clear so that heather and other heathland species can flourish. There is much evidence that the wild boar are moving westwards in the woods and we found several rootings including this one at Brede High Farm where the animal appeared to be digging up road stone - perhaps showing off to a potential mate. With the brighter light and still no leaves on the trees, the lower plants show up well on the trunks where many species of moss, lichen, liverwort, algae and fungi can often be found happily growing together. This picture shows the dilated scalewort (Frullania dilatata), a widespread liverwort that usually grows on tree trunks (like this one). 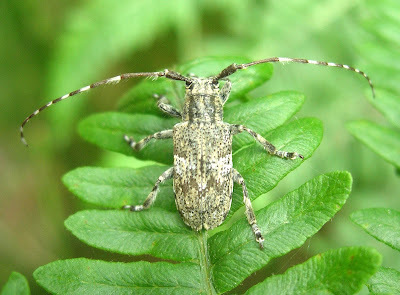 I have just found out that my friend Dave Monk took a splendid photo of the Red Data Book 3 longhorn beetle Mesosa nebulosa in Brede High Woods last July. This is the first record of this species in Sussex and it shows how important these woods are for invertebrates. M. nebulosa does not visit flowers and often remains high in the canopy, so it is rarely recorded. The larvae bore into the cambium and later the sapwood of various trees.